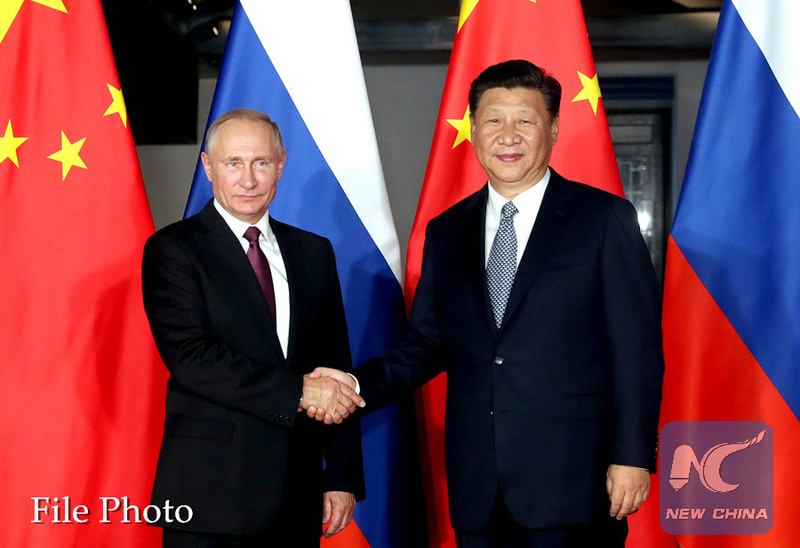 MOSCOW, Sept. 10 (Xinhua) -- Growing cooperation between China and Russia will bolster the development of bilateral relations, Chinese Ambassador to Russia Li Hui said in a recent interview with Xinhua. "At present, China-Russia relations are at their best in history. Mutual support for major initiatives and development strategies, as well as the two heads of state attending significant events held by each other are important manifestations of the high-level bilateral relations," Li said. The Chinese ambassador made the remarks ahead of the fourth Eastern Economic Forum to be held in the Russian city of Vladivostok on Sept. 11-13. Chinese President Xi Jinping will attend at the invitation of his Russian counterpart Vladimir Putin. It will be the first time for the Chinese president to participate in the annual event. "This is a major milestone in the history of China-Russia relations in the new era and will inject new strength and lasting power into the development of China-Russia comprehensive strategic partnership of coordination," Li said. Against the backdrop of anti-globalization and protectionism trends in the world, Xi's presence in the forum shows the world that partnerships of mutual benefit promote regional economic development, he said. Aimed at establishing a new platform for economic cooperation in the Asia-Pacific region, the Eastern Economic Forum is having a positive impact internationally, especially in Northeast Asia, he said. Li hopes that China and Russia will take the forum as an opportunity to promote the synergy between the Belt and Road Initiative and the Eurasian Economic Union, thus further contributing to regional economic integration. Economic and trade cooperation between China and Russia has entered a new stage, one featuring rapid growth, positive outcomes and great potential, Li said. In January-July 2018, bilateral trade between China and Russia increased by 25.8 percent year-on-year to 58.35 billion U.S. dollars. The ambassador noted in particular that China and Russia, through their geographical advantages, have greatly boosted regional cooperation across a number of fields in recent years, especially in the Russian Far East. "The cooperation between China and Russia in developing the Far East has achieved remarkable results and has become a 'business card' for regional cooperation between the two countries," Li said. According to Li, the two sides have established an intergovernmental commission for expanding ties between Northeast China and the Far East and Baikal Region of Russia, implemented 28 projects of cooperation across various fields and are working together on projects related to interconnectivity and infrastructure. It is both promising and feasible for bilateral trade to reach the goal of 100 billion U.S. dollars a year, Li said.